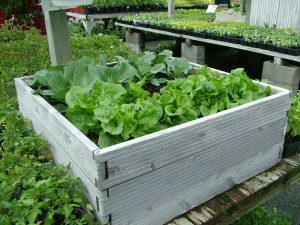 Raised beds are gardens which are higher than the surrounding soil and usually limited to a size where you can work the bed without having to step in it. There are several advantages to a raised bed: You can improve soil conditions without having to dig as deeply into the ground, especially here in Northern Virginia with its clay soil. You can raise the height of the bed so you don’t need to bend over as much which is very useful if you suffer from arthritis, use a wheel chair, or just want less stress on your knees and back. You can build a small bed on a table which can be placed on your patio or deck. If you are interested in building a raised bed, there are two types: free-style or formal. These are raised beds built directly into the ground by mounding the soil at least six to twelve inches. To create free-style raised beds, remove any sod (lawn) and dig up at least two to three inches of regular soil for a six-inch bed or four inches of soil for a twelve-inch bed. Since most soil in this area is heavy clay soil, you will want to add more top soil as well as organic matter such as compost, peat moss, or manure. The ratio that you want in your raised bed is one-third native (existing soil), one-third top soil, and one-third compost. Once you’ve installed your plants, make certain to mulch, add the appropriate fertilizer, and water properly. The disadvantage to a free-style raised bed is that over the years the soil settles and you lose the elevation of the bed. However, the advantage to this method is that you have improved soil and less initial cost. These are beds created by using timbers, rocks, containers, or special kits. For easy access to the plants in your bed, you want to make certain that the bed is no more than four feet wide. However, if you want to build the bed next to a wall or fence, or make the bed wheel chair accessible, keep the width no more than three (3) feet. You can build the bed as long as you want, but a shorter bed is easier to fill with the right soil mix than a longer one. You want to build the sides of the bed between six to twelve inches tall, depending on the plants you choose. For example, if you want to plant lettuce or flowers, six inches will be deep enough. If you want to plant tomatoes, you need the full twelve inches of depth. You can build this raised bed on the ground, a deck, or even a table. Just remember that if you’re building a raised bed on a deck or even a table, know how much weight your deck or table can support. If you want to use stones or cement blocks to build the sides of the raised bed, you’ll need to use mortar or footings if the bed is two feet or taller. Just be careful with stones or cement because they can raise the pH over time. The disadvantage for a formal raised bed is the initial cost of materials. The advantage is that once the structure is created you have a lasting raised bed. The best mix for a raised bed is one-third natural soil, one-third top soil, and one-third organic matter, such as compost, peat moss, or manure. If you live in an apartment or home where you’re building a raised bed on a deck, you want to change the formula slightly. You’ll want one-third top soil, one-third potting mix (with vermiculite), and one-third organic matter, such as compost, peat moss, or manure. The great thing about a raised bed is that you can plant flowers, herbs, and vegetables or even a combination. You’re just limited by the size and your imagination. Once you’ve installed your plants, apply mulch, add the appropriate fertilizer, and water properly. Make sure your raised bed is no wider than four (4) feet, unless you want it wheel chair accessible. If you want it wheel chair accessible, make it no wider than three (3) feet. One-third natural soil; one-third top soil; and one-third organic matter, such as compost, peat moss, or manure. One-third top soil; one-third potting mix with vermiculite; and one-third organic matter, such as compost peat moss, or manure. Apply mulch to the bed.